We’re back again, Fangirls! It’s that time where we go over the best comic and just die because it’s so perfect! I sure hope that you’re ready for this, because I don’t know if I am. In issue 19, everything became a giant mess of sea serpent, lake water, and merpeople. 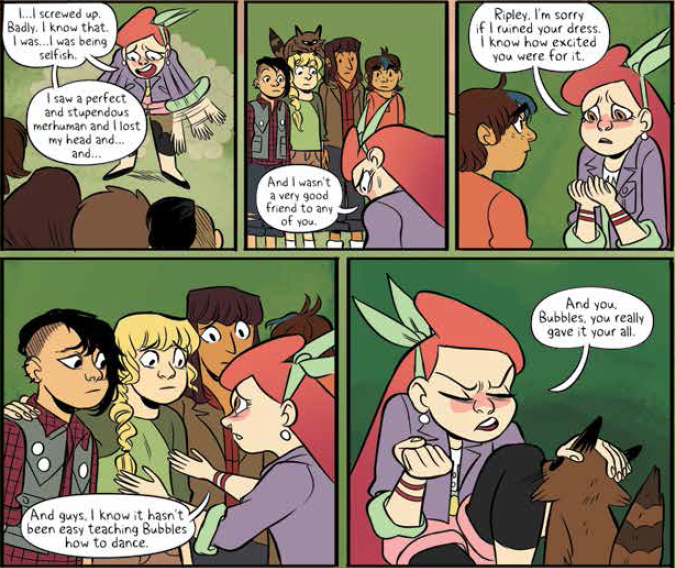 Issue 20 starts off with Jen running for Rosie, and Jo telling April what’s up. She explains that though she loves April’s headstrong passion, sometimes April forgets about the plans her friends have. She doesn’t always remember that their stuff is important too, and ends up mistreating them, accidentally of course, and it stinks. April lets that sink in, and apologizes to each and every one of the friends that she’s harmed. I thought that was wonderful. Then, she has another idea. 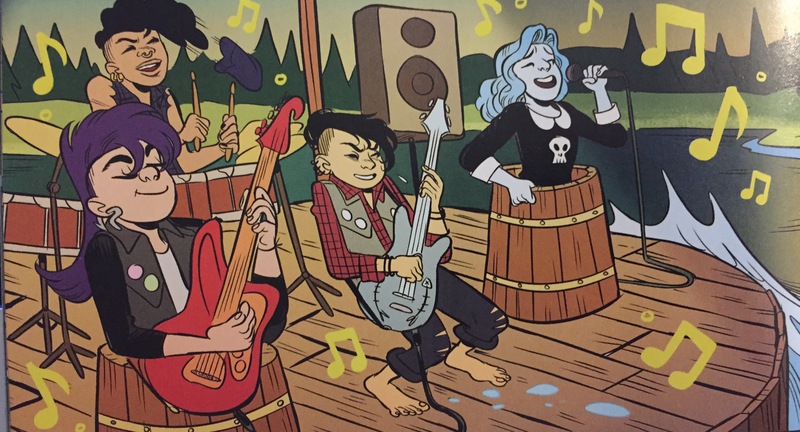 The Lumberjanes spilt up, and April heads back to the lake. There, she sees Harlow, and explains that the mess is her fault, and she’s super sorry. They fight back the serpents, both above and underwater, where they even run into Taylor. There, Harlow and Taylor talk about how junky they used to sound, with their minimum knowledge and cruddy set up. But when Carter comes to scream at them, Taylor gives it right back to him, telling him that Harlow is back in the band, and he is welcome to swim off if he’s not down. Surprise, surprise, he’s not down. 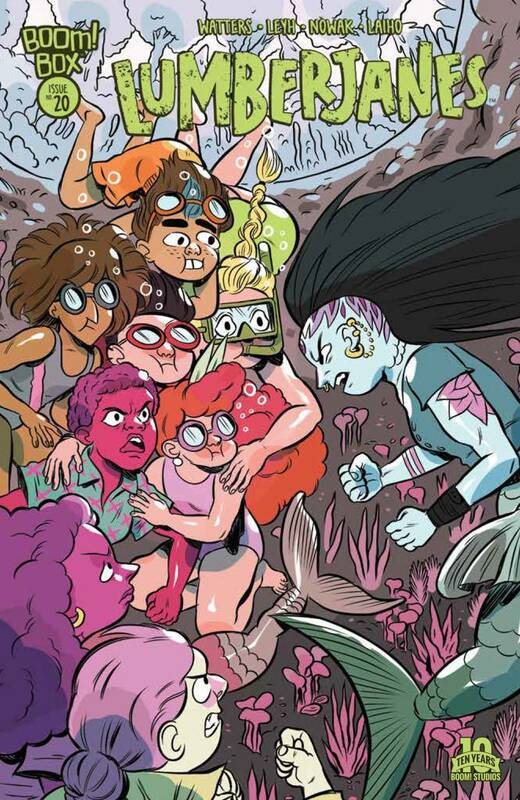 After swimming off, his sister, Skylar (who is the most precious and adorable of the merladies in this comic) steps up, saying that she knows all of their songs; new and old. They let her be the singer, but there’s no audience! Back at camp, Ripley and Molly have convinced Rosie to have the Bandicoot Bacchanal at the lake, since it’s so peaceful there. They set up, and the mergirls PPP up with a floating barge stage (complete with water barrels for them to swim in), and they rock it. They even get Mal onstage to play with them! Riley’s dress gets done, Bubbles shows off his dance moves, and everything looks pretty darn good. It sure looks like a happy ending for all. Let’s see what issue 21 brings, Fangirls.